Trickster 1 was created for production of the Fantasticks set in a warehouse in New Orleans. The Characters came in and out of the masks stored there for Mardis Gras. This mask one of the many masks encountered on a sunny world tour. The design of this mask is heavily inspired by Balinese Topeng. Because of the bulging eyes the mask has a very high energy and dynamic presence. The trickster is a character that has been present in story telling since stories have been told. The trickster is often responsible for the creation of the world, the changing landscape and the invention of the most useful tools known to humans. Everything the trickster touches or every activity they engage in fails in as big a way as possible and somehow in the end results something extraordinary instead. Raven boy in the Native American stories gets bored in the dark, steals the fire from the sun and accidentally catches the earth on fire bringing it to life for the first time is a great example of the trickster creating success out of failure. Trickster 1 was created for production of the Fantasticks set in a warehouse in New Orleans. The characters came in out of the masks stored there for Mardi Gras. This mask one of the many masks encountered on a sunny world tour. 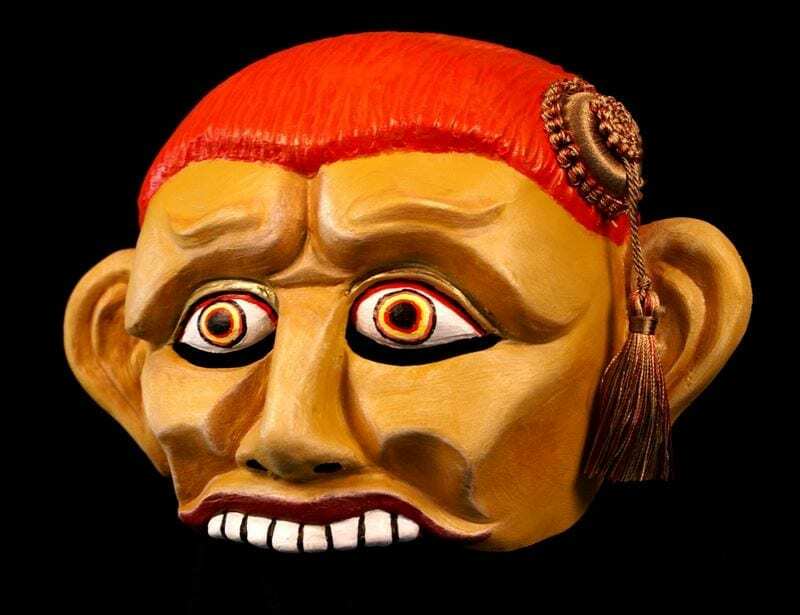 The design of this mask is heavily inspired by Balinese Topeng. Because of the bulging eyes the mask has a very high energy and dynamic presence.